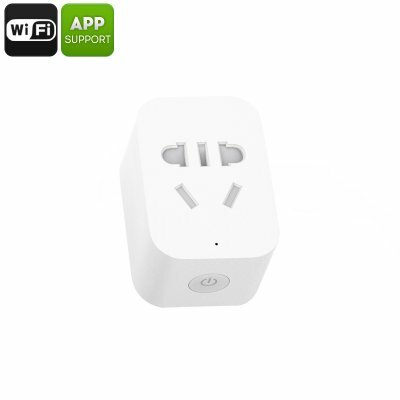 Successfully Added Xiaomi Mi Smart Wireless Socket - App Control, Overload Protection, Fire Resistant, AU Plug, Android And iOS Support to your Shopping Cart. The Xiaomi Mi Smart Wireless Socket offers a safe and energy efficient way for you to control your power usage while charging your electronic devices. When synchronized with the Xiaomi multifunctional gateway, it allows you to enable and disable the power supply to your electronics from afar through the dedicated mobile application. Compatible with both Android and iOS smartphones, you’ll be able to use this cool electronic gadget with the vast majority of mobile phones on the market. Thanks to its compact and lightweight design, this smart socket can be easily carried around anywhere you go. Whether it’s on a business trip or holiday, from now on you’ll always be able to control the power supply to your electronics via your smartphone. Thanks to its overload protection, you’ll be able to keep your electronics plugged in and charge your devices without needing to worry about damaging them. The Xiaomi smart wireless socket furthermore features a fire resistant design – making it extremely safe to use. When connected to your WiFi network via the Xiaomi gateway, this cool electronic gadget offers different smart features for you to use through its mobile App. Not only will you be able to simply switch on or off the power supply from afar – it also lets you schedule certain times during which it will light up your house. This comes in particularly handy when you are enjoying your holiday abroad but do not want to give unwanted visitors the impression that your house has been left unattended. Thanks to its AU plug, this smart socket can be used in the majority of Western countries including the EU and USA. This smart socket comes with a 12 months warranty, brought to you by the leader in electronic devices as well as wholesale electronic gadgets..
Arabic: - مأخذ توصيل الذكية - Chinese Simplified: - 智能插座 - Czech: - Inteligentní zásuvka - Danish: - Smart stik - Dutch: - Slimme Socket - French: - Prise intelligente - German: - Intelligente Steckdose - Hebrew: - שקע חכם - Hindi: - स्मार्ट सॉकेट - Italian: - Presa intelligente - Japanese: - スマート ソケット - Korean: - 스마트 소켓 - Malay: - Soket pintar - Norwegian Bokmål: - Smart Socket - Romanian: - Smart soclu - Russian: - Смарт-розетка - Spanish: - Enchufe inteligente - Thai: - ซ็อกเก็ตสมาร์ท - Turkish: - Akıllı yuva - Vietnamese: - Ổ cắm thông minh.